Last week, we started off with a weekly update list that will let our followers know which device was updated and in which region by Samsung in the last week. Well, you can now download the latest list of firmware updates from the link below. For those who would like to get these updates daily, kindly make sure to follow @SamKiesUpdates on Twitter. 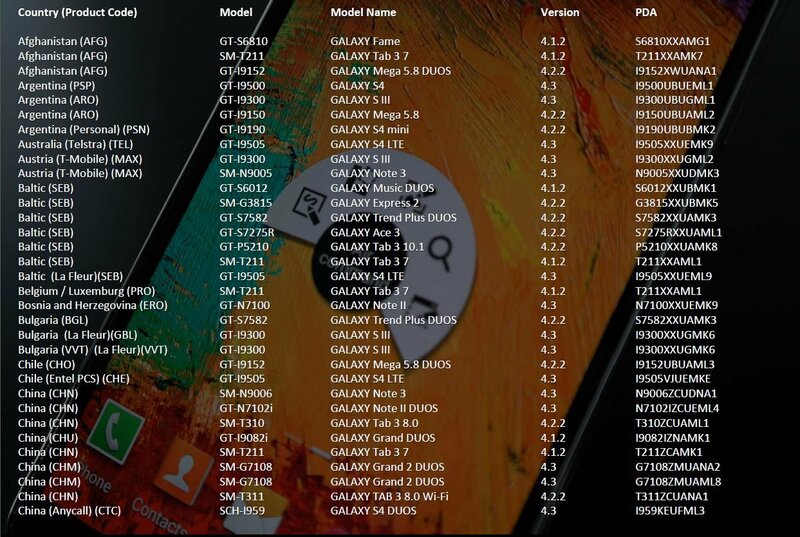 Samsung updates devices by using Samsung KIES or OTA (over the air) – of course, all of these firmware are available for download from SamMobile’s firmware page. Hello..just wanna know..is it all 4.3 update for s3 dont have light effect?? Thanx..
Hello, no there was no effect of light on this firmware! Note II in Argentina? PERSONAL? Samsung S IV was uploaded. 4.2.2 and 4.3 and 4.4 ? I have an iPad 2 and also a N8000 (Note 10.1 – old version). The systems are different and I will not compare. But with respect to the device, Apple the Convention of 10 0. Not to mention that all the devices are also updated. Now that’s respect for the consumer. Regardless of whether you like this or that. Respect first. samsung products = SHITS !!! I will destroyed my phone soon..
6 months???? It was released in NOVEMBER 2013.
ok 3 monts.. but it`s too much time..
Yeah. We got our last update on january (a4.0 -> 4.1), then only fixes. Already year gone and noting. well, what can you expect from a toymaker? Samsung kidding. Must have something against N8000. Someone high up in the company must have had some bad experience with the device. And is taking revenge. Can only be that. Leaving the world Samsung. Going to the world Nexus. when 4.3 in Ghana still on 4.1.2 been waiting for ages galaxy s3 .. .. When Android 4.3 update for NOTE II will be available in Macedonia (VIM), I am waiting 2 months now. Whhhheeennn whhheennn????? Yeah but it has more features like move app to sd card which I need it (I’m gonna buy a 64gb sd card memory). Is odin dangerous? Can it brick your phone? I heard that odin deletes my data. And the update is legal from samsung if I update using odin? if ace 3 can get android 4.2.2, why can’t S2??? Because Ace 3 is a newer device and 4.2.2 is just one update for it. S2 already received two major updates, so that’s it for the device, that’s how it works in the Android world, sadly.